The Chester White breed originated in Chester County, Pennsylvania and thereby derived its breed name. At first it was called the Chester County White, but later the "county" was dropped. Previous to 1812 there were Yorkshire and Lincolnshire animals that had come from England. The Chester breed was derived in Jefferson County, New York. These three breeds were intermingled for some years previous to 1815. Sometime between 1815 and 1818, Capt. James Jeffries imported from England one white boar which was referred to as a Bedforshire or Cumberland. 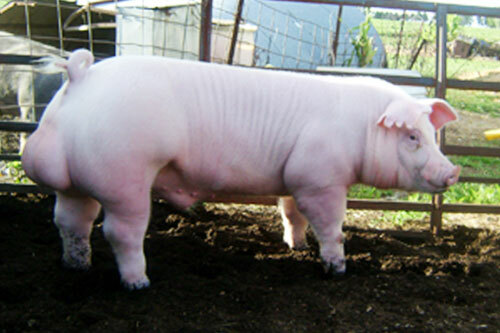 This boar was used extensively on white animals in this county and from these matings the Chester White breed started. Thomas Sharpless started the first Chester White Record Association in 1884 and he was its first secretary. From that period, until recent years, there were several record associations developed as the breed spread across the country. This did not lend great help to the full development and promotion of the Chester White breed. The National Chester White Record Association was formed in 1893, with offices in West Chester, Pennsylvania. In 1885, an association was formed to record the "Todd" strain, and in 1894, this became the American Chester White Record Association, located in Columbus, Ohio. Also in 1894, the Standard Chester White Association was formed in Indianapolis, Indiana, and in 1909, the Western O.I.C. Recording Co., Inc. was formed in Nebraska. It was through the efforts of F.F. Moore, Rochester, Indiana, that all of these associations and recording offices were combined into one recording, association. This association was named the Chester White Swine Record Association, with headquarters in Lima, Ohio. Eugene Black, Scio, New York, was the first president and F.F. Moore, with offices in Rochester, Indiana, the first secretary. All of this gathering and combining of associations started about 191 1. This trend continued until 1930, when the Chester White Swine Record Association was reincorporated under the laws of Delaware, with offices in Rochester, Indiana. The offices moved to Peoria, Illinois on June 1, 1986 (and this is the present location). Arthur Tomson, Wabash, Indiana, became president in 1930 and served in this capacity until 1963. Levi P. Moore became secretary of the association in 1931 and served until 1968. J. Marvin Garner became secretary in 1968, upon the retirement of Levi P. Moore. Larry Rus assumed the secretaryship in 1969, following the resignation of J. Marvin Garner. In 1973, Lyle R. Alumbaugh became the secretary following the resignation of Larry Rus. In 1977, Daniel Parrish became secretary and still serves in that position. In 1910, the three elder sons of F.F. Moore Fred, Levi, and Jim - started the first breed magazine, the White Breeders Companion. This was in the period of few newspapers, no radio or television, and few other sources of news. The magazine often had over 200 pages. In July, 1918, the name of the White Breeder Companion was changed to Chester White Journal, the title carried today by the breed's official publication.